Sustainable Food Center is a longtime sponsor of the annual Texas Organic Farmers and Gardeners Conference, and is proud to announce the availability of Texas Farm to School Round Up Farmer Scholarships to attend the 2017 pre-conference Farm to School workshop and the two day TOFGA Conference. The 2017 TOFGA Conference will start on January 12 with pre-conference workshops and continue through January 13-14 with conference sessions. It will be held at the Mesquite Convention Center in Mesquite, Texas. As part of a USDA Farm to School Training Grant, in collaboration with Texas Organic Farmers and Gardeners Association and Texas Department of Agriculture, SFC will issue up to 18 travel stipends of $150 for farmers and ranchers to attend the preconference Farm to School Workshop and full conference. Applications are reviewed as they are received – earlier applications will receive priority review. Approved applicants will receive a discount code via email for use during registration. 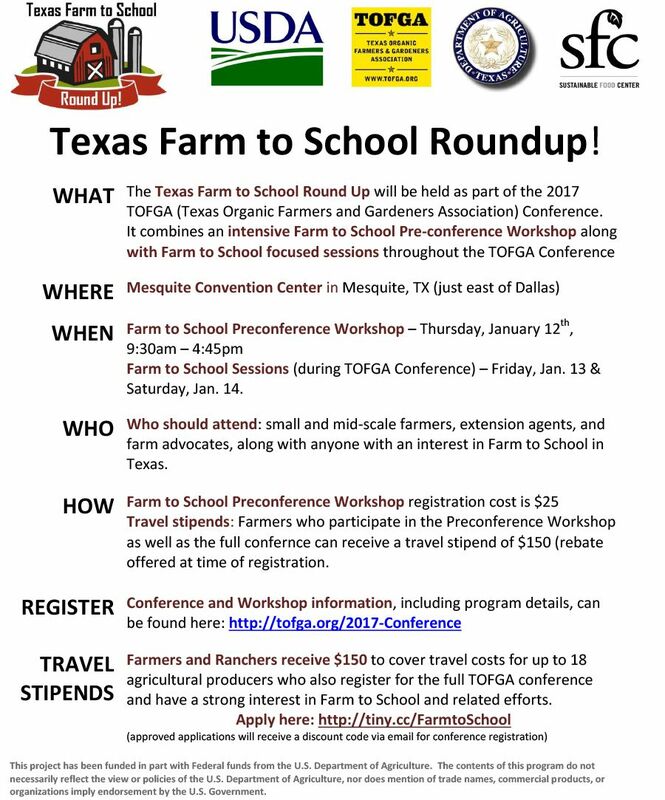 For more information about the Farm to School Round Up pre-conference workshop and the Texas Organic Farmers and Gardeners Conference, please visit: http://tofga.org/2017-Conference.